Herbert Austin (1866 - 1941) later to become Lord Austin designed his first car (a three wheeler) for Wolseley in 1895. In 1905 he founded his own car manufacturing business the Austin Motor Company in Longbridge, Birmingham. Production of Austin motor cars began in 1906 and the famous Austin Seven was first produced in 1921. By 1934 Austin was Britain's leading car manufacturer. During the Second World War Austin only really built vehicles for the military so no new models were produced until 1947 when the A40 Dorset and Devon were introduced. Many more new models followed during the 1950's including in 1959 the new Austin Seven - now known to us all as the Mini, which has remained in production in various guises although basically the same car until very recently. In the 1960's Austin became part of BMC (British Motor Corporation) which also incorporated Morris, Riley, Wolseley and MG. From then on it was possible to buy what was virtually the same car in either Austin, Morris, Wolseley or Riley versions. This is what became known as badge engineering. During the 1970's the British Motor Corporation was taken over by British Leyland, which later became Austin Rover. Following this the Austin name was dropped and the Rover group was later bought by BMW. While BMW still own the rights to the Mini the rest of the Rover group (apart from Land Rover which is now owned by Ford) was bought out by the business consortium Phoenix, who now produce the new Rover and MG models. The Austin A30 saloon car was introduced in 1951 and featured a newly designed 803cc four cylinder overhead valve engine which later became known as the A series engine. The Austin A35 was introduced in 1956 to replace the A30 and shared very similar styling to it - the main differences being a larger rear windscreen and different front grill treatment. The Austin A40 Farina was the first Austin to have its body designed by the Italian stylist Pininfarina. This car was launched in 1958 as a 2 door saloon or 3 door countryman. 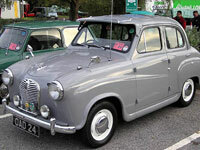 The Austin A40 Somerset was launched in 1951 and had a short production run of just two years. It was similar in appearance to the smaller A30 saloon car. Flamboyant, Americanised, Over the Top, all words that have been used to describe the Austin Atlantic. Whatever emotions this unique car evokes you can be assured that it will turn heads wherever you go.